Yesterday's workout wasn't that intense, so I decided to step it up a little this morning with a tempo run. I woke up with a neck ache that I'm sure was caused by my Brookstone Shake Weight. 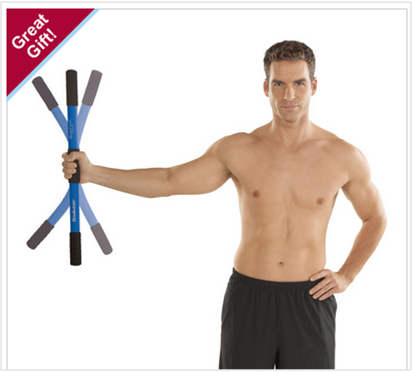 This is a weighted balanced stick that you shake to (supposedly) build muscle via "dynamic inertia." I used it a couple of years ago but started getting back aches. I grabbed it out of the closet the other day thinking it might be a good way to work on arm strength without weights. Whether it was the shake stick or something else, my neck was in pain. It felt like a pinched muscle but it didn't hurt so bad that I couldn't do my run. In deference to the discomfort, I decided to keep it fairly short. I started the tempo about a minute slower than training pace and held that for about 15 minutes, gradually increasing every quarter mile until I finished near my current 5K race pace. After I'd completed my run, I took an Aleve. Even after putting some heat on it, the pain is still there, although it's not as intense as it was this morning. I'm hoping that a good night's sleep will get rid of it for good. I'm excited to be doing the GLIRC Clubhouse run tomorrow morning with my running friends, the Petite Pacer and SIOR. I'm really excited about that. As for the Shake Weight, it's either back to the closet or bound for the trash. I hope you're feeling better this morning! Thanks TPP. It was still a bit sore today but it's getting better.